1.Heat oil in a saucepan over moderate heat. Add the mustard seeds, when they splutter, add bay leaves and asafetida. Add ginger, green chilies, coriander powder, garam masala and turmeric powder. Fry the spices until aromatic. 2.Add all the vegetables and stir fry for couple of minutes. Pour the coconut milk and water. If desired, a little more water can be added. 3.Reduce the heat to low and cook partially covered for 10 minutes. 4.Grind the masala paste in a blender until smooth. 5.Add the salt, tomatoes and grinded masala paste to the simmering vegetables. Cook over low heat until all the vegetables are cooked and tender. Add the curry leaves and coriander leaves. 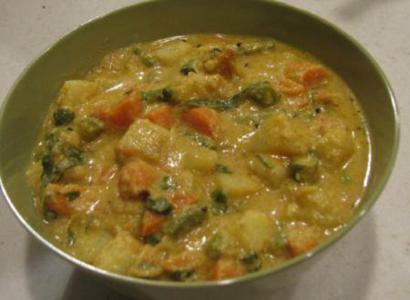 Serve this kurma with either chapatis, puris or pulao.